As it appears, most of the street flea markets in Copenhagen are closed from November to some moment in early spring. However, this didn’t stop me from finding some gems! By the way, if you decide to look for antiquarian shops or flea markets, seems that loppe is the right keyword to use. As in loppemarked (flea market) and loppe shop, or something like that. At least Google Maps acted much more reasonable when I switched to these Danish terms. Anyway, I plan to take this thing apart and to restore each of the elements to its former glory. I hope that this composing stick is still usable. By the way, it was made by the company established by one J.G.A. Eickhoff. Among other things, it produced equipment for printing and book production. You may find letters J.G.A.E. on some of that machinery. In the end of this post I will add several videos about the use of a composing stick. By the way, is that metal board the other things are glued to also some sort of a tool used by printers? Or that’s some random thing? Another advice for those planning to visit antiquarian places in Copenhagen: do not believe ratings on Google Maps! There was no place with marks higher than 3.5 (out of 5) or something. But I loved all of them! The ‘printer’s set’ was found at Den Blå Hal – The Blue Hall. It’s a building that hosts several shops. Don’t forget to take some local currency with you, as not all the sellers accept card here. I found some more things there, and I’d like to show you some of them. 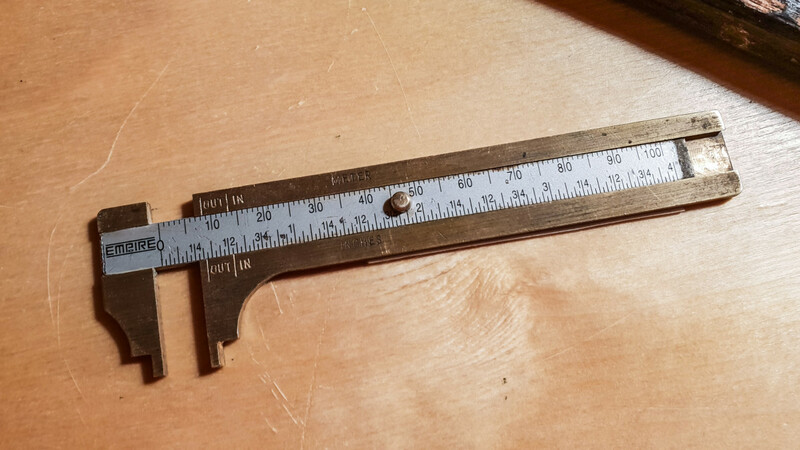 Check how the marks are made for measuring the inside and outside distances. Next, I’ve got this thing. I guess that it is a wax seal. Beautiful letter G and ornamentation, check the second photo to see it reversed. Updated 28.11.2019: Many thanks to Ivan Gulkov, who identified this as one of the “Cloister Initials” designed in 1918 by Frederic Goudy for the American Type Founders. They were done in various sizes, and have recently been recast by Gregory Walters. Mine is modified and set on a wooden handle. That’s why I thought it is a wax seal. The second two of the four images below are from the ATF Specimen Book. And the last but not least, a ledger made somewhere between 1878 and 1889 by a printing and bookmaking enterprise in Copenhagen. It was possible to pinpoint the date range because only in these years the chance to see the name Axel E. Aamodts lithografiske Etablissement and to receive a book from Axel E. Aamodt himself was possible. He died in 1890, and before 1878 and after 1889 the company had different names. The book is in a fine condition, with a binding that’s still strong. Only some scratches and minor damage to the spine and other elements. Half-leather binding with marbled paper used for the cover and endleaves. Edges are marbled as well. The pigment on the ages has faded, however. What impressed me even more, is that it doesn’t have any notes in it. It’s completely empty! Hm… I almost forgot I promised to write about the airport security check. I often get separated from my wife in airports, because I always have lots of wires, batteries, phones, laptops, and other electronic things with me. I try to put them aside when placing the stuff in the boxes before the X-Ray machine, but more often than not they decide to make an additional check anyway. This time it was different. I had almost no electronic stuff. Still, I was asked to wait while the additional check was made. Well, I forgot that all these printer’s thingies are made with lead and other metals that are absolutely non-transparent for the X-Ray machines. Obviously, the security officers were surprised to see something like that.